Trainer Roger Mayweather believes that for Manny Pacquiao (55-5-2, 38 KO’s) to attract a lot of interest in a Pacquiao vs. Floyd Mayweather Jr. fight in the future, he needs to defeat WBO welterweight champion Tim Bradley (31-0, 12 KO’s). Roger thinks a win over Bradley will get boxing fans excited for the Pacquiao-Mayweather bout because Roger thinks that fans really like Bradley. I’m not sure if that’s actually the case, to tell you the truth. A win over Pacquiao over Bradley would say about as much as a win for Pacquiao over Brandon Rios. 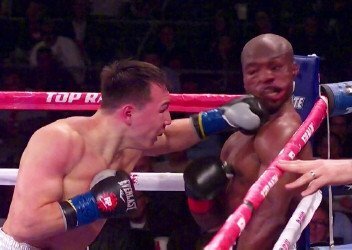 There are better fighters at 147 than Bradley, and I wouldn’t be surprised if he were knocked out if he were to ever face Ruslan Provodnikov again. I’d favor Adrien Broner, Marcos Maidana, Keith Thurman, Devon Alexander, Kell Brook, Amir Khan, Robert Guerrero and of course Floyd Mayweather Jr. to all defeat Tim Bradley. You can throw Provodnikov’s name in the pile as well, even though he’s not a welterweight. As for the light welterweights, I’d favor Danny Garcia and Lucas Matthysse to beat Bradley, and I think Zab Judah would give Bradley a huge run for his money in a life and death fight for Bradley. I think fans are going to want Pacquiao to fight Mayweather no matter who Bob Arum digs up for Pacquiao to fight. We just saw Pacquiao beat a fighter coming off of a loss in Brandon Rios, and already fans are crying for the Pacquiao-Mayweather fight. There’s nothing golden about Bradley that will make fans want to see a Pacquiao-Mayweather fight anymore than they do right now. I think fans would be more interested in seeing a match-up between them if Pacquiao were to fight and beat someone that’s actually good like Saul “Canelo” Alvarez or one of the names that I mentioned. But Bradley, he got exposed badly by Provodnikov last March, and then he ran from 40-year-old Juan Manuel Marquez for 12 rounds to beat him by a 12 round decision last October. Previous boxing news: Bellew-Stevenson tonight: Will Tony be KO victim #20 for Adonis?